Have you been told that your commercial water heater needs maintenance? Or, is your water heater malfunctioning? Even if it’s been years since a technician has had a look at your water heater, we can help. The commercial water heater experts at Front Range HVAC have been performing expert-level maintenance on all makes and models of commercial water heaters for over 20 years. We’ve seen it all when it comes to water heater faults, from leaking to poor efficiency all the way to complete system failure. Many of the most critical issues that affect water heaters can be avoided with regularly scheduled maintenance. By investing in this maintenance today, you’ll be sparing yourself the cost of having to replace your commercial water heater prematurely. 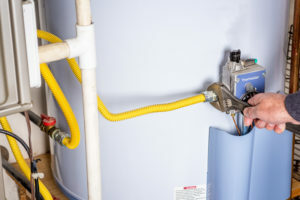 Leaking, dripping, or water accumulation at the base of the water heater. This is almost always a sign that a pipe has become corroded or that a connection is loose. Reduction in hot water production. Some older water heaters can slowly stop working overtime, even though they may appear to be functioning just fine. If your hot water has gotten colder and colder over time, your water heater probably needs to be looked at for maintenance. Popping, hissing, or gurgling sounds coming from the water heater. The water heater is not responding to on/off commands from the thermostat. Visible corrosion, especially on the main water tank itself. If a problematic commercial water heater is left to operate without acting, the results can be catastrophic. With enough time, even the best-built units will fail if they are not given the maintenance attention they need. When this happens, water egress into the area can result in serious damage, sometimes costing thousands of dollars to repair. Get in front of needless water heater faults by scheduling maintenance for your commercial water heater. Front Range HVAC is your first choice for expert water heater maintenance service provided by the best-trained technicians in the industry. There’s a reason why we’ve grown to become Colorado’s #1 provider of commercial water heater maintenance services. It’s because we know the equipment, we invest in our personnel, and we go the extra mile to ensure that you are 100% satisfied with the work performed. To discuss having a Front Range HVAC technician visit your commercial property for water heater maintenance, give us a call today. Just dial (303) 942-1372, and a member of our team will be happy to help. We look forward to working with you! Brian was our technician, and from the moment he arrived to the time he left his professionalism and knowledge was great. He was on time and answered any questions that I had. Brian kept his work space clean, remained on task and was organized which was very much appreciated. This was the first time that we used Front Range HVAC but it will not be the last. The price that they quoted was the price that we paid and they came in hundreds of dollars less than the competition. Overall it was a great experience and I would definitely recommend asking for Brian to be your technician. Front Range Heating, Ventilation and Cooling (HVAC) was the only company that completely solved my complex central air conditioning cooling problem. Having 3 failed attempts by 3 previous HVAC companies, Front Range HVAC was given a chance based upon my neighbor’s recommendation. Front Range HVAC provided the technical expertise and professionalism to work through my cooling issue and come up with the right solution. I was impressed by their dedication, working diligently until my problem was resolved. They are an exceptionally well managed, efficient company using the latest technology that produced outstanding results. I was equally impressed by the fact that Front Range HVAC stood behind all their promises made to me. Their staff is informative, courteous, prompt and technically advanced. I am exceptionally pleased with the service that Front Range HVAC provided, it was truly refreshing to work with a company that always had your best interests in mind. A special thanks to Jeremy (co-owner) in providing me with his special attention and expertise in helping resolve my issue. If you want it done right the first time, I highly recommend Front Range HVAC for any of your heating or air conditioning needs. Jeremy and his team from Front Range Did an outstanding job installing our air-conditioning unit. We could not have been more impressed with their professionalism and quality of service. Getting a new air conditioner is not just about the unit itself but increasing the overall air-quality inside your house and that’s what Front Range specializes in, Eliminating the pollutants another nasty stuff that makes it way into your air ducts. If you’re looking for a local company that truly cares about his customers give these guys a call you won’t be disappointed. We hired Front Range HVAC to complete an install of a new A/C unit, Furnace and new Tankless Hot Water Heater. Bob (the Salesman), was very knowledgeable about the products, what we needed for our home and was extremely insightful with answering our questions. On the day of the install, Josh called us and confirmed they were on their way. As soon as Josh and Angel arrived at our house, they introduced themselves to us, completed the walk-through and asked if we had any questions. Jeremiah arrived shortly after and introduced himself right away also. They were amazing people who were working in our home. I typically would had stayed home during the whole install process, but I didn’t need to with these guys. They were informative about what they doing, how the install was going and if they ran into hangups. They were very trustworthy, clean and presentable every morning they arrived. They were punctual every morning with what time they would be arriving and also made the best effort to be out of our house at a decent times. I would trust them and hire them again for any of my HVAC needs because they proved themselves and their work. This is an incredible company!!! You cannot go wrong hiring Front Range HVAC for your HVAC needs. The product (central air) and quality of work was excellent. The technicians explained whenever there was something unique to be completed with my particular configuration and kept us informed throughout. We have been enjoying the cooling and the air purification products installed. I have realized significant improvement in my allergies while indoors. We recommend Front Range from our experience.